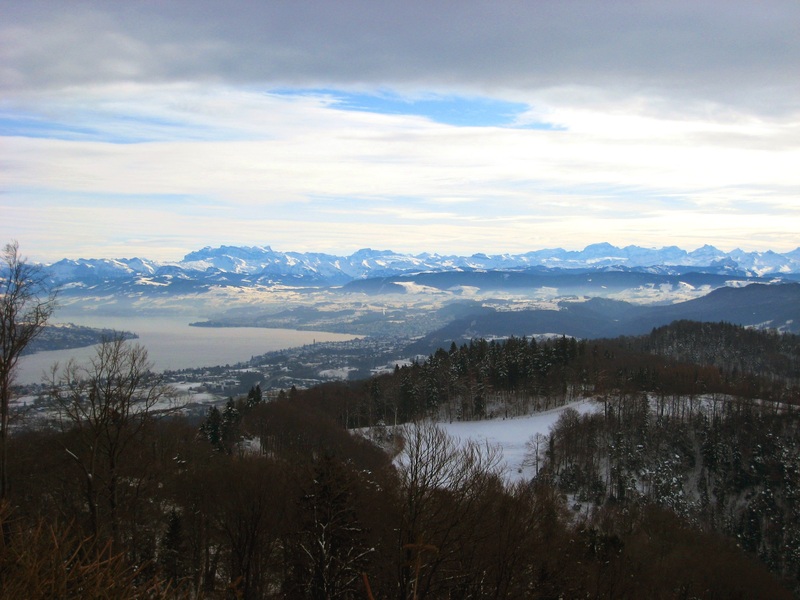 Fantastic views of the Alps, Lake Zurich, the Limmat River. Rolling hills and centuries-old cathedrals. 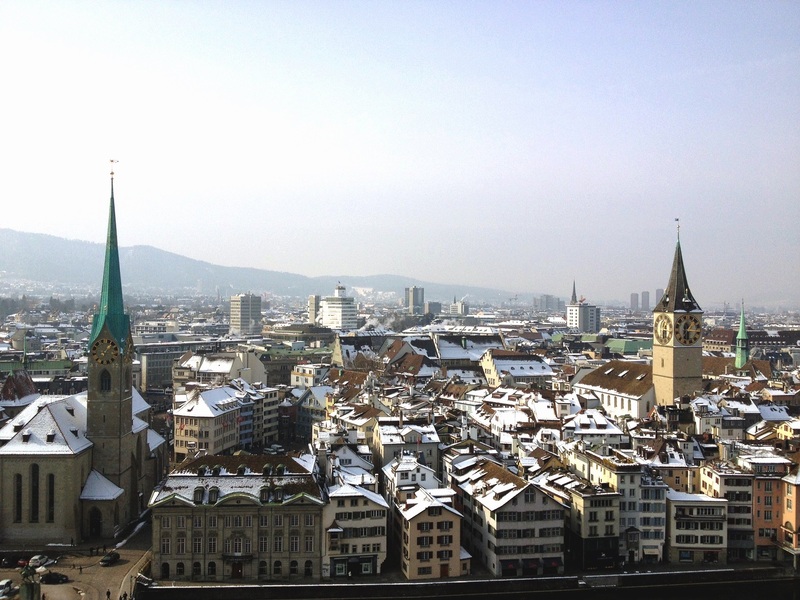 Winter, spring, summer or fall – Zurich is a charming and beautiful city in any season, from any angle. Here are my favorite spots for a great view of the city I currently call home! 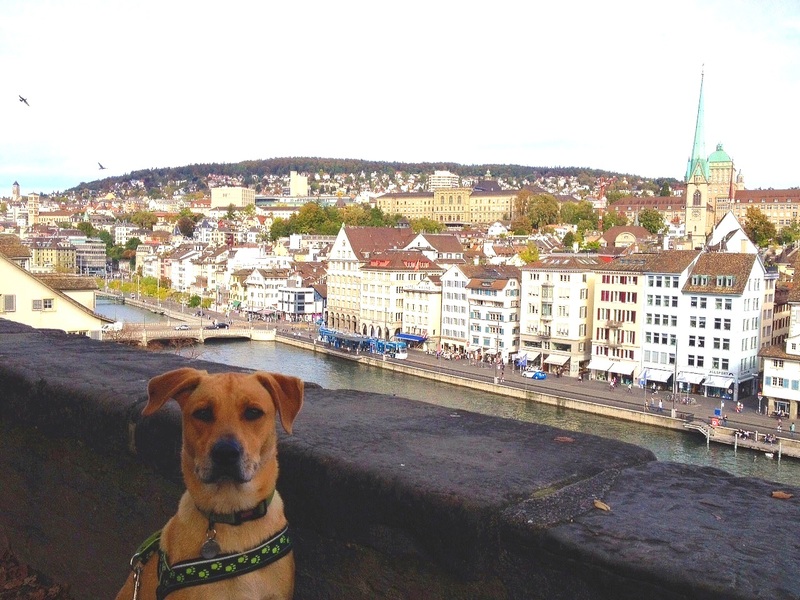 The Lindenhof Square is located in the heart of the city with a panoramic view of Zurich’s Old Town, the Grossmünster Cathedral, Zurich City Hall and the Limmat River. If you love chess, this is also a great place for the game, with over-sized chess pieces and a constant stream of competitors to flex those brains. 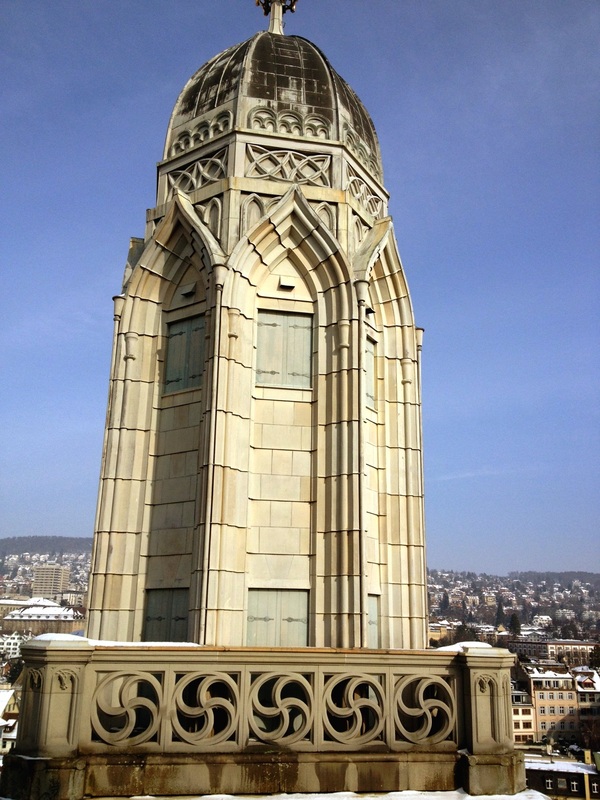 For just a few francs, you can access the towers at the top of the Grossmünster, the 12th century cathedral in Old Town Zurich. 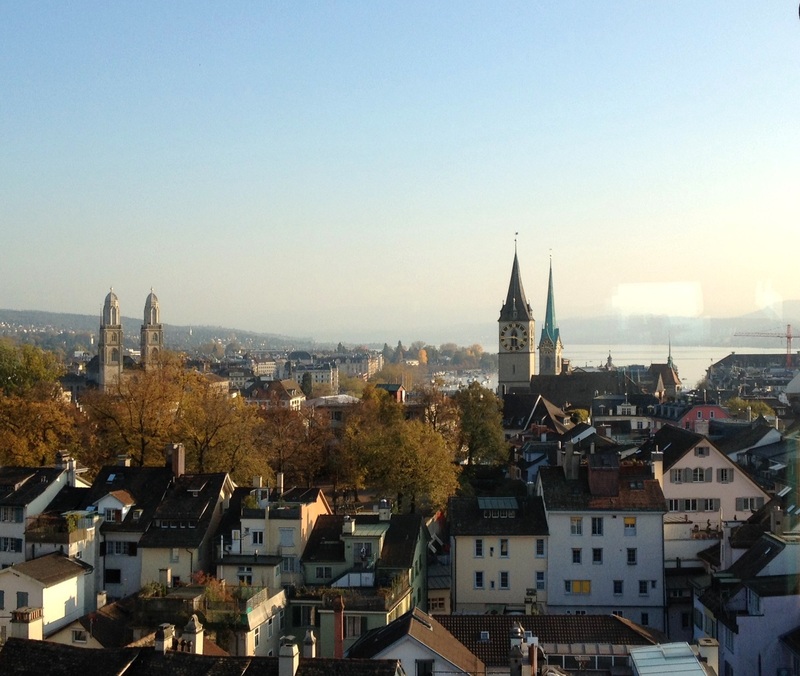 Climb the 200 or so steps and be rewarded with excellent views of the city and the Grossmünster’s neighboring cathedrals, the beloved green-roofed Fraumünster and the St. Peterskirche, which boasts the largest clock-face in Europe. 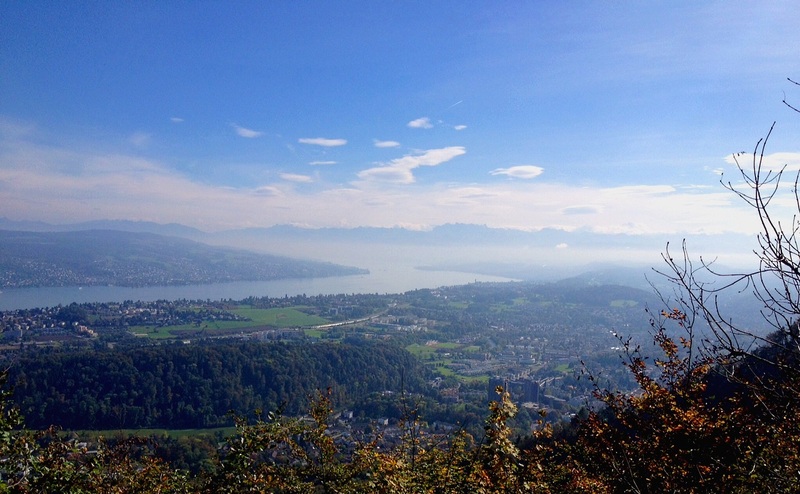 Hike, bike or take the train to the top of Üetliberg – Zurich’s local mountain at almost 900 meters high. This is one of the best spots in Zurich to catch a glimpse of everything from the city below to the lake to the Alps in the horizon. 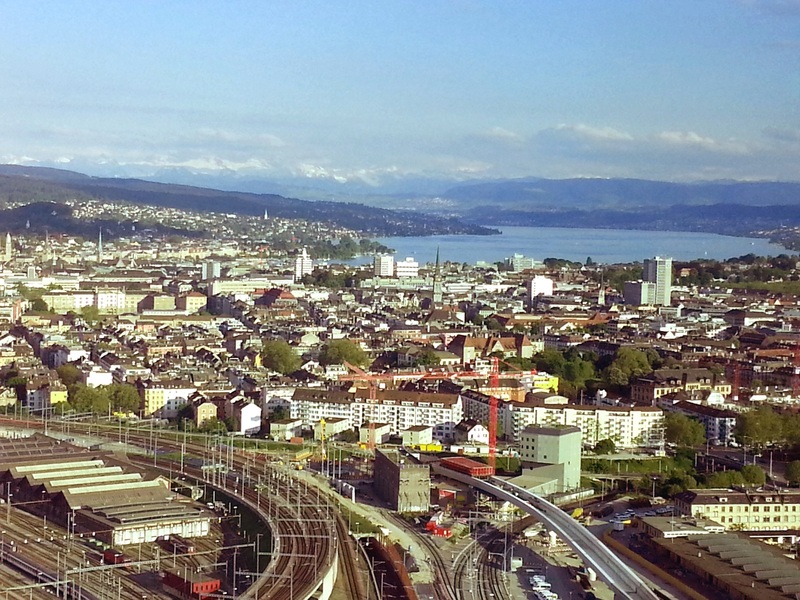 The Clouds Bar & Restaurant is located on the top floor of the Prime Tower, Switzerland’s tallest building at 36 floors. I know what you’re thinking…only 36 floors? But you’ll get a great view because well, everything else is so short by comparison 🙂 The bar is a nice place to have a drink and the food is quite good too – same kitchen as the restaurant but at half the price, with the same view. Who can complain? The Dolder Grand Hotel, located in the hills at the Kurhausstrasse, is a luxurious 5-star hotel in Zurich. You don’t need a room (or be a millionaire) to access the view though. Walk around the grounds, enjoy the rolling hills, take in the view of the city and the lake below. And if you have some cash to spend, treat yourself to the spa – you don’t have to be a guest to indulge in the amenities. If you’re looking for some R&R with a view, the thermal baths at the Hürlimann Areal is your solution. 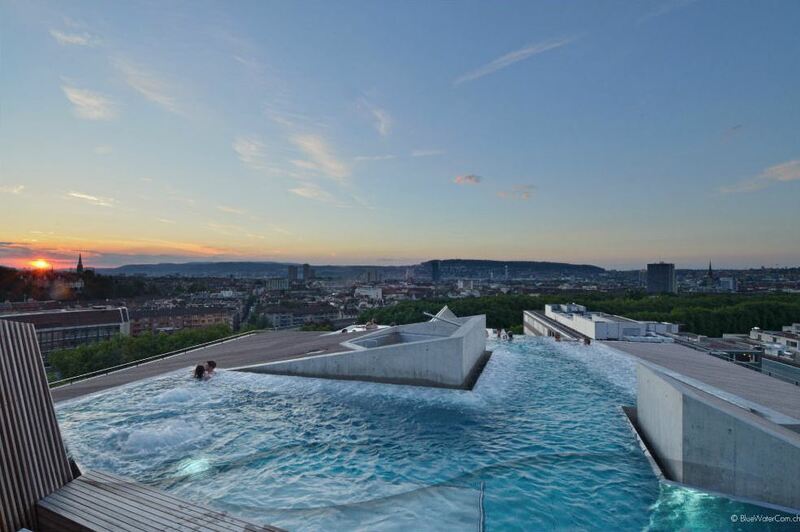 You can rejuvenate from the warm healing water of the rooftop pool while enjoying the great view of the city. Win/Win! 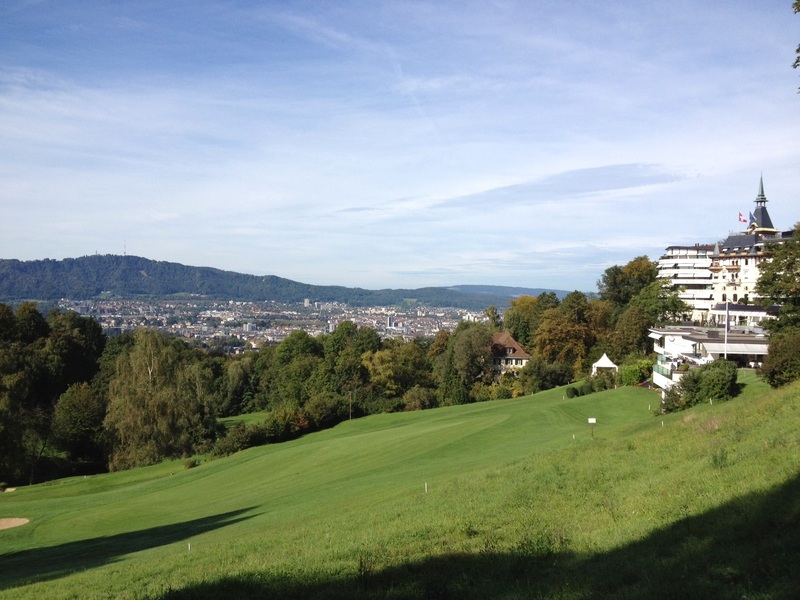 beautiful pictures of Zurich and surrounding area! !